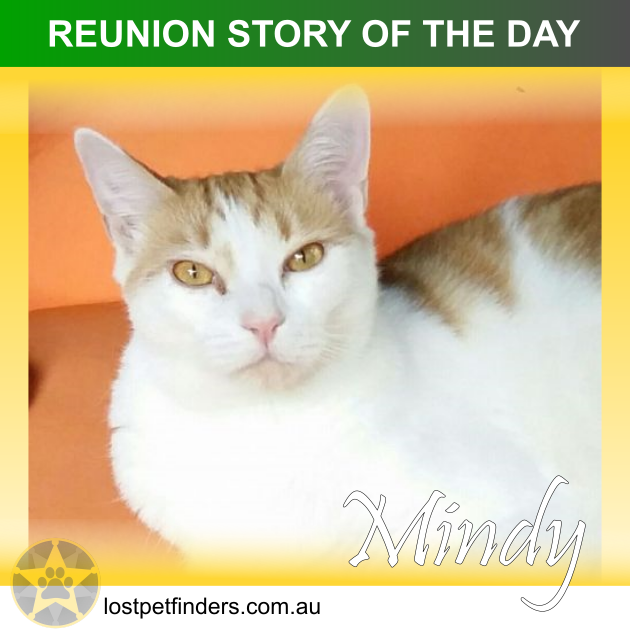 "Mindy is one of 3 siblings and along with mother cat they were once owned but when their owners moved out of house they left Mum and 3 babies behind to fend for themselves. After some time a Rescue group found and trapped them and I become their foster carer and later signed over to me after having them all for 9 months. A lovely couple decided they would adopt Mindy and her brother. They were on adoption trial when the couple needed to travel to their holiday home as it was flooding and bundled the pair into their large soft crate for the 4 hour journey. At the half way point the lady decided to offer them a drink of water in their carrier in the car and when a little opening was unzipped Mindy jumped through and ran off into scrub. I travelled from Sydney to Raymond Terrace the day I found out (day after her jumping out). Before I left I put her on Lost Pet Alert and also paid for the advert to go to the local vets, rangers, pounds etc. I also printed up flyers to put up in the local area. I was certain I was going to bring her back that day with me…..but was extremely disappointed when I couldn’t see her after 2 hours drive and 6 hours searching I had to leave and make the drive home again through blurry eyes! The best part is from the Alert going to local vets one of the local Rescue ladies (Kylie from Port Stephens Rescue) called me and met me up on site and she told me that she would continue to stay on the case until Mindy was found! She had such determination, patience of a saint, and would put feed stations out in various areas. Go looking after midnight. See which food station was eaten etc and concentrate on the area. We had a number of people with sightings but it wasn’t Mindy. Luckily one day (after 2 weeks being missing) Kylie (from Rescue) was on her rounds and actually sighted Mindy laying in the sunshine in long grass near a timber yard. Sadly there was flooding and heavy rain from that night for 3 days. Kylie knew Mindy had shelter and would be safe and kept the feeding up which was taken each night and then knew to concentrate on that area. The food stations were moved closer to an area where she could be trapped. After 3 weeks and 1 day of being missing she was finally trapped. Kylie took her to the vet straight away who apart from some cuts, dirt and a little gash was in good health. It was a great team effort as we were constantly on Messenger with updates and keeping Kylie uplifted as she was doing a fabulous job for us. I printed more flyers and letterbox drop flyers that Kylie had distributed. It was determination and not losing faith that kept us all going. The first light was Kylie sighting her. From then we kept up the hope she would stay in the area. Mindy was approx 700 metres from where she first went into the scrub and had found a quite, safe place and stayed there.